That's right. Drink it in. You could eat off those wall panels. A panel found in Portal 2. Panels are the fundamental building blocks of Aperture Science Test Chambers. Panels can be placed anywhere, and can be used to form walls, floors, ceilings or even Crushers. Because the orientation, angle and height of Panels can be adjusted as needed, they can be reconfigured in order to create a near-infinite number of variations. Due to their range of uses and large number of possible permutations, Panels are an ideal choice for constructing test chambers, and allow those in charge to create new chambers with new obstacles and hazards on-the-fly. 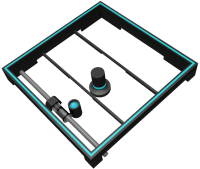 Panels are capable of aiding or impeding the player's completion of the task at hand depending upon their placement. Non-static Panels in test chambers are usually activated through the use of Buttons, which will either add or remove panels to or from the player's path. For example, a series of Panels can be used to create a new walkway or staircase, provide a surface upon which a Portal can be placed, or to provide a barrier to prevent the loss of critical items such as Weighted Storage Cubes. Panels can be used effectively in virtually every test, making them very useful for trapping a Test Subject or shielding the player from a hazard. This mechanic becomes much more crucial during Co-op, as Panels are often present in order to block one partner from crashing into a hazard, or are used to prevent the duo from easily accessing a certain area. Wheatley opening panels to help Chell escape from GLaDOS' tests. This page was last modified on 18 May 2012, at 05:57.